The GSX-S750Z blends GSX-R750-derived engine performance with an ergonomically sound chassis to fashion a naked sportbike that gathers attention everywhere you ride it thanks to its dark, sinister appearance. 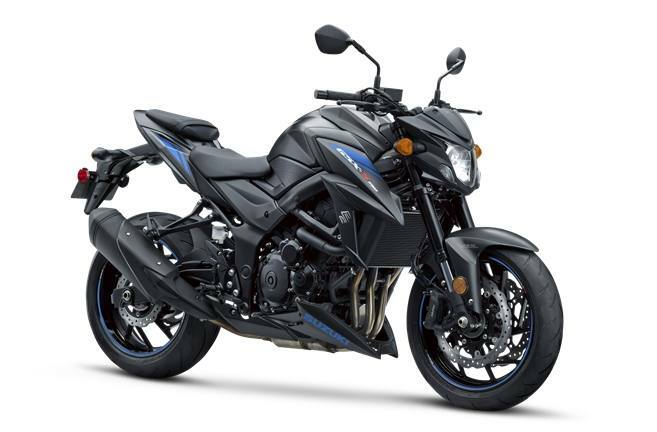 The GSX-S750Z's aggressive styling with blacked out engine and chassis components set it apart from other middleweight sportbikes, and many of those competitors cost considerably more to purchase and own. As with the GSX-S1000, this GSX-S750Z inherits its heart and soul from Suzuki's MotoGP race experience and the 30-year heritage of the GSX-R750. With strong, torque-rich engine power and a suite of rider-assist features, this GSX-S750Z is ready to capture hearts and turn heads as the performance value leader in its class. This is the perfect sportbike response to the craving of today's discriminating riders, as the GSX-S750Z looks great and outperforms other entries in the class. It is nimble, comfortable, and an exhilarating, fun ride that retains Suzuki's heritage of quality and reliability. Suzuki's patented, Throttle-body Integrated Idle Speed Control (TI-ISC) stabilizes the engine idle speed and helps lower emissions. The system is compact and lightweight. 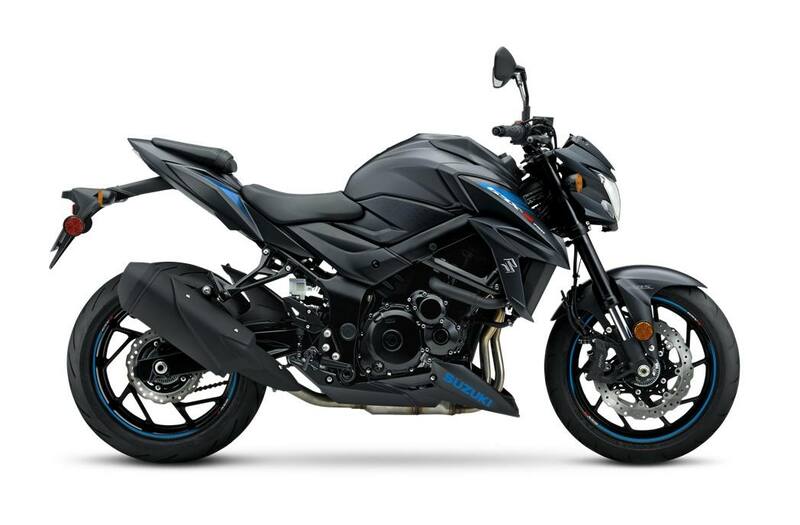 The TI-ISC on the GSX-S750Z has Suzuki's Low RPM Assist feature that seamlessly adjusts engine speed during takeoff and low-speed riding to smooth the power delivery and to help reduce the possibility of the rider stalling the motorcycle. 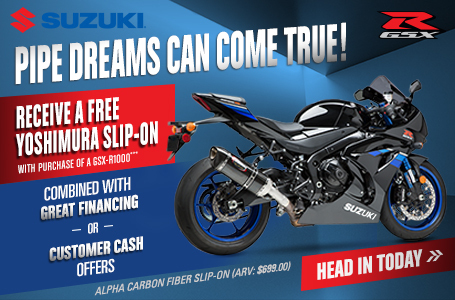 Suzuki's Advanced Traction Control System* lets the GSX-S750Z rider control the throttle with more confidence in various riding conditions. As a result, the rider can enjoy sport riding with less anxiety. There are four traction control modes (1, 2, 3, and OFF) that the rider can easily adjust at rest or on the fly via a handlebar-mounted control. The difference between the modes are their sensitivity to road conditions.• Mode 1 is the lowest sensitivity level; most suitable for skilled riders or in conditions that have good road surface grip (sport riding on good, smooth roads).• Mode 2 is a moderate sensitivity level; suitable for most riders or in conditions that have varied road surface grip (city riding, regular road conditions).• Mode 3 is the highest sensitivity level; suitable for road conditions where the grip may be limited (wet or cold surfaces).• OFF disengages all traction control features. The black-finish, aluminum hand and foot controls provide excellent action and contribute to the motorcycle's sporty style. This GSX-S750Z has the Suzuki's Easy Start System that requires just a simple touch of the starter button to fire up the engine (without pulling the clutch lever if the transmission is in neutral). Warranty: 12-month unlimited mileage limited warranty. Extension: 12-month unlimited mileage limited warranty.